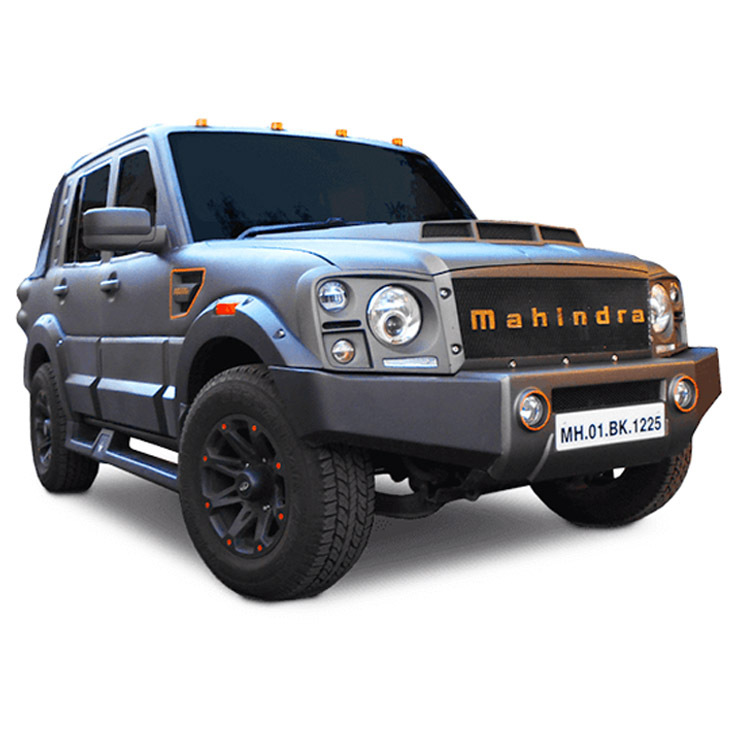 10 factory-custom Mahindra SUVs you can buy: Scorpio Darkhorse to Bolero Stinger! India’s custom car scene has come a long way from the days of backyard garages and today there are a whole host of shops that put out tastefully and sometimes outrageously cool modified vehicles onto India’s roads. In the past few years, car manufacturers have also started getting into the customization game and offer factory-built modded versions of their cars and SUVs. 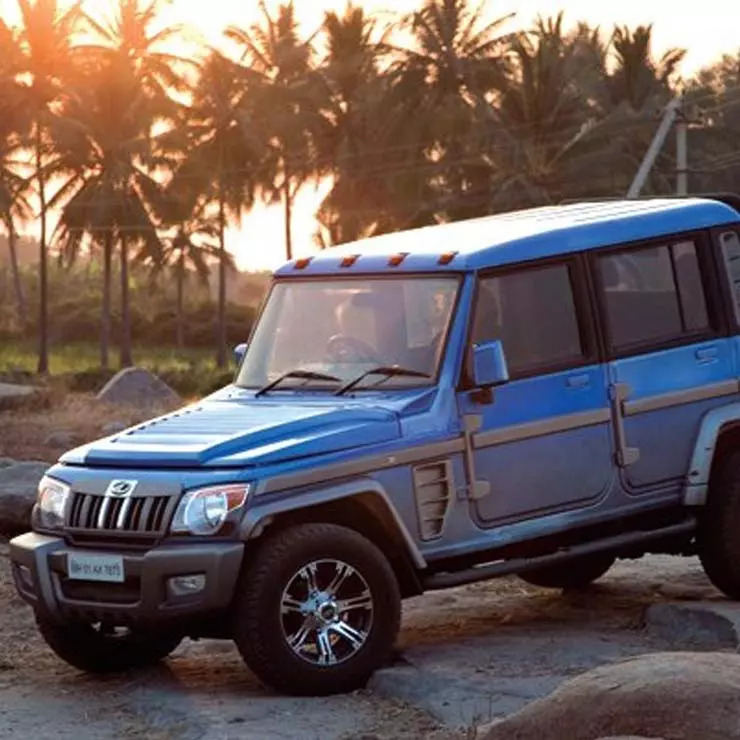 The manufacturer that really seems to take this factory-custom idea very seriously is Mahindra, which offers numerous custom versions of its cars and SUVs and in this post, we’ll take a look at a few of them. The KUV100 is the smallest car in the Mahindra range. The KUV100 isn’t what you would call an aggressive looking vehicle. At Auto Expo 2018, Mahindra unveiled the KUV Xtreme, a menacing looking modified version of the smallest vehicle from the carmaker. 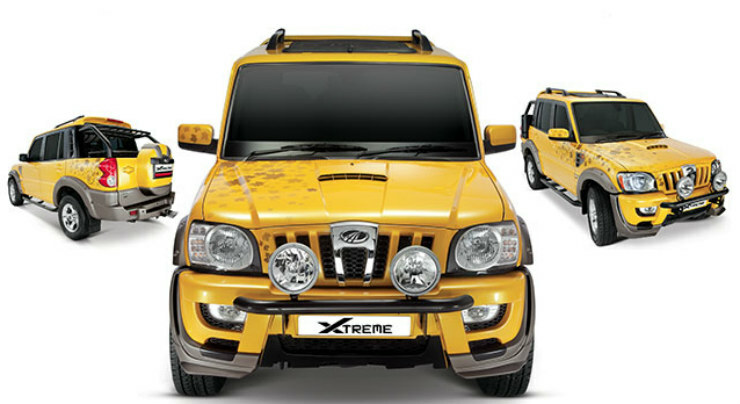 The Xtreme features an aggressive and larger front bumper along with a large skid plate up front, along with flared wheel arches and black plastic cladding, all around along with a rear diffuser, This mean looking wannabe sand basher also sports a wider track, larger wheels and tyres, a matte orange paint scheme along with a twin exhaust system. This is one KUV100 that truly isn’t one for straight-laced. The Mahindra TUV300’s design is inspired by a tank and the Armour takes this to a whole new level. The TUV Armour is basically a regular TUV300 with numerous custom accessories and body cladding added on. These changes make the Armour look like it is something that wants to go to war. 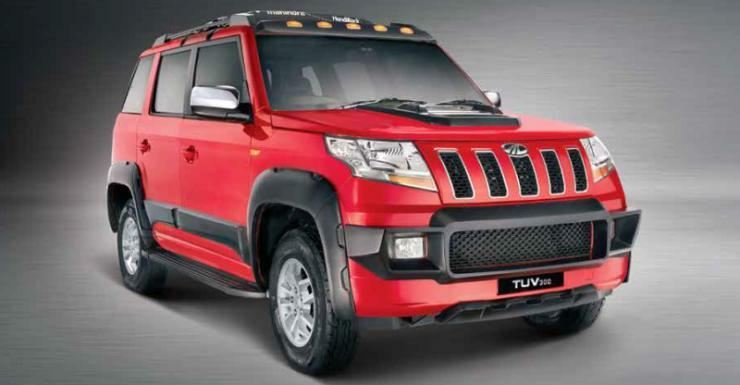 The TUV Armour was the first custom SUV of its type in the sub-4-metre compact SUV segment. 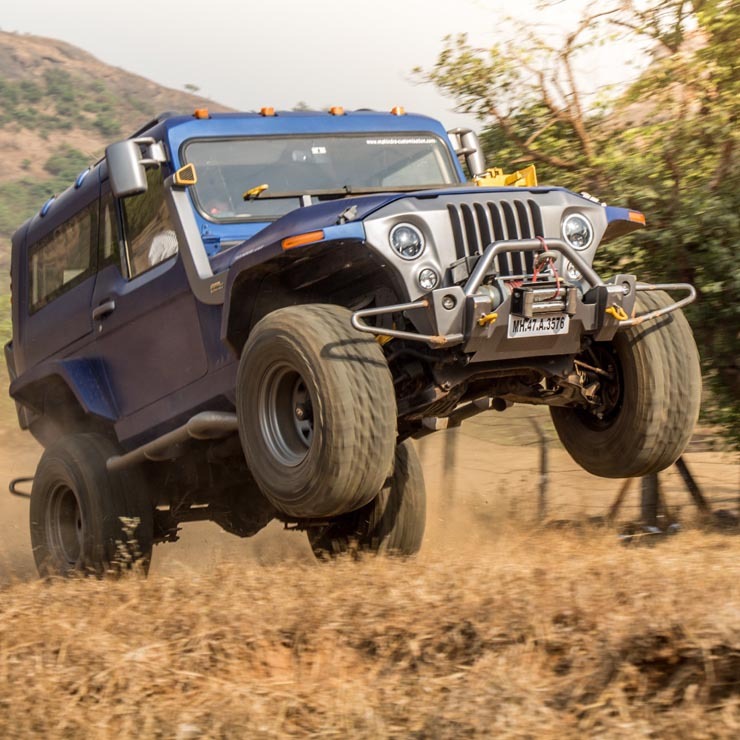 The Thar Daybreak takes the off-roading icon to a whole new level with a whole load of customizations. The Thar Daybreak, which debuted at the 2016 Auto Expo featured LED DRLs up front and LED taillights along with redesigned doors. 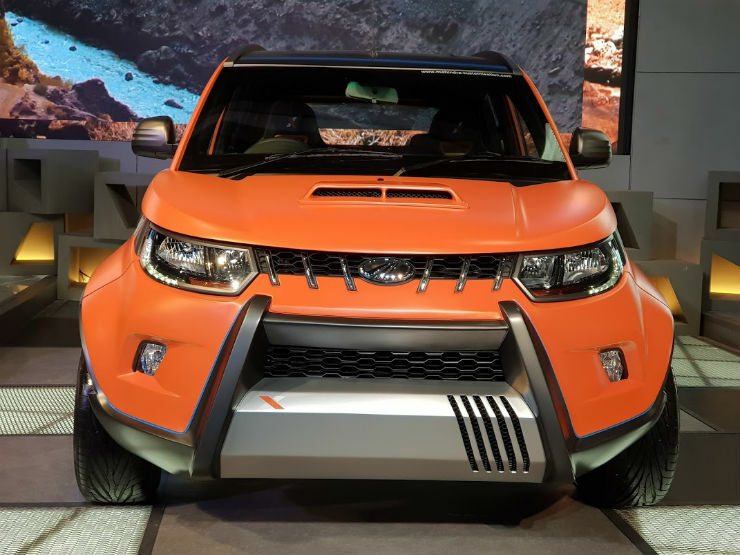 Other changes include the addition of winch on the custom front bumper, a hood scoop and a raised ground clearance. The Thar Wanderlust debut at Auto Expo 2018 as an even more modified version of the Daybreak. The Wanderlust featured Gullwing doors, a new front grille and custom fenders and wheel arches underneath which sat wider tyres. The Wanderlust also featured a winch similar to the one on the Daybreak, a custom twin-exhaust system and an electric matte blue paint job. 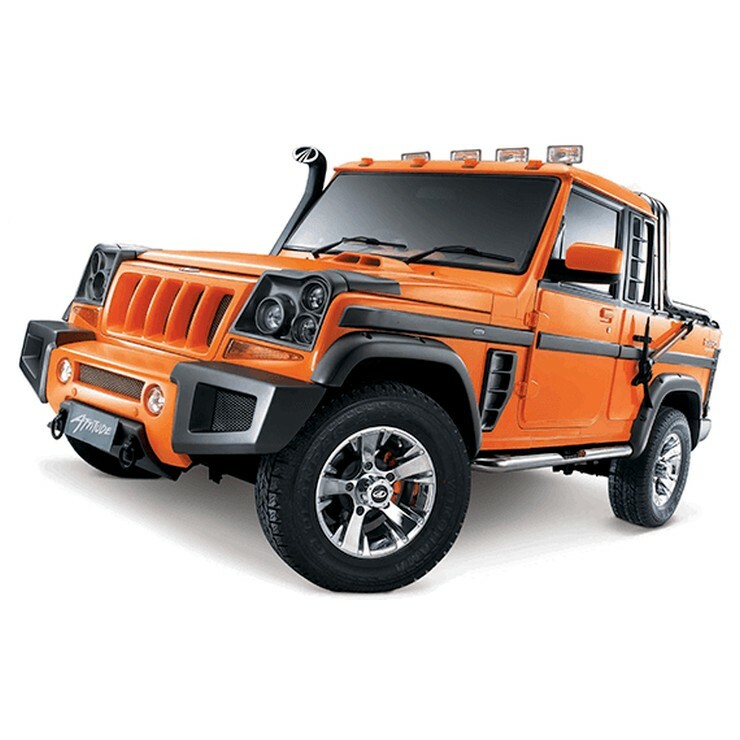 The Darkhorse is a more rugged version of the regular Scorpio and sports a matte grey paint scheme with orange highlights along with a wire-mesh grille and custom bumper. The new bumper sports two auxiliary lamps that complement the custom three-pod headlights and the Darkhorse also sports large air intakes on the bonnet. The Scorpio Extreme converts the SUV into a dual-cab pickup truck with plastic cladding on the wheel arches and bumpers. A metal bar attached to the front hosts the auxiliary lights. Other changes on the Extreme include a sunroof, the roof rails and a vibrant yellow paint scheme. This Bolero lives up to its name with a single cab pickup body. along with custom grille and front bumper with tiple-pod headlights, a new front bumper with towing rings, hood scoop, four aux lights on the roof along with a snorkel and a pickaxe mounted on the side. It also gets black cladding all around along with an orange paint scheme for the exterior. The interiors are mostly black but sport orange highlights. Mahindra has used the Stinger badge on many of its cars. The Bolero features two versions of the Stinger with the first based on an older version of the UV. 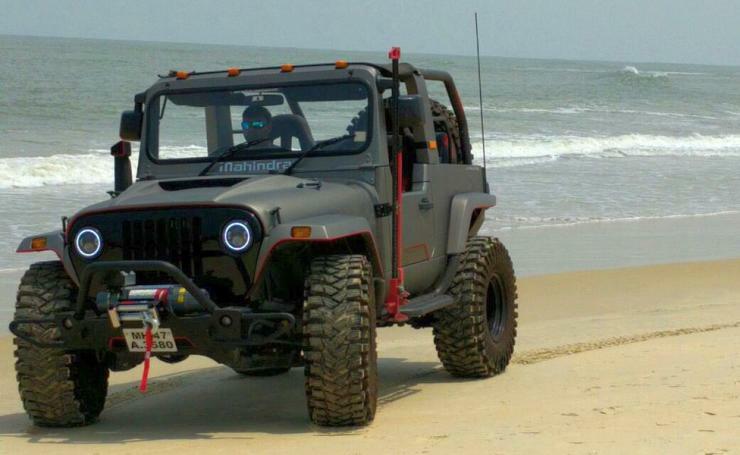 This Stinger features round headlamps, a beefy front bumper that host two pairs of aux lights. This Stinger sports a pickup body style (dual-cab) faux air vents on the fenders and a custom bonnet. 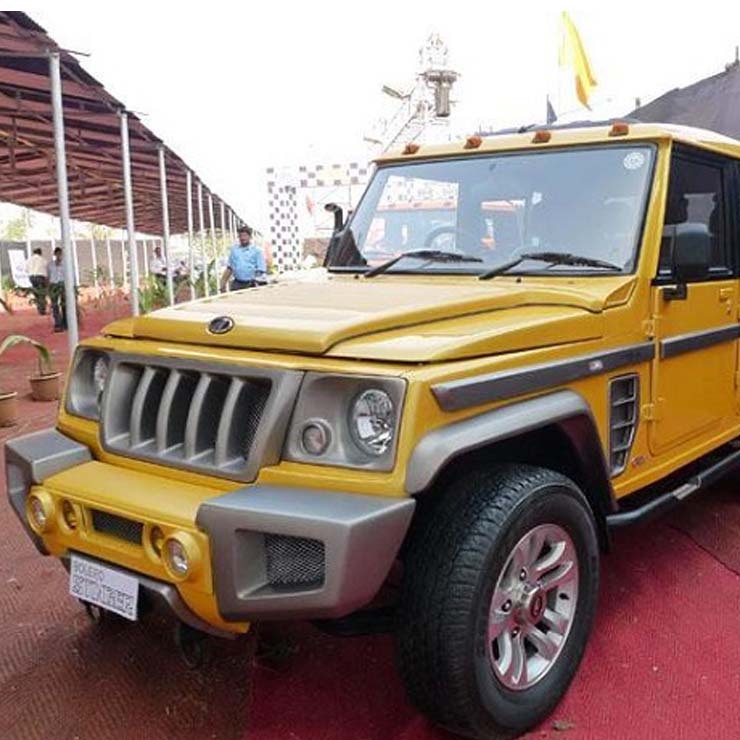 The second Bolero to bear the Stinger badge gets a rather familiar front end to the regular UV. However, the bonnet sports faux air intakes/vents and the dual cab pickup is painted in a rather pleasant shade of blue. The Stinger II gets multiple plastic cladding add-ons its body along with a cool set of alloy wheels which add some bling to this pickup. « Hyundai Creta Diamond Edition with panoramic sunroof: This is IT!